This spring, visitors to Legoland California will be able to take a stroll through a brick-based recreation of the forests of Endor. Legoland California is hard at work on a new Star Wars area of the park, which will feature scenes from all six movies and the Clone Wars cartoon meticulously recreated in Lego bricks. Ten employees from Legoland Germany have been working on the models for over a year, and their efforts will be unveiled in California on March 31. 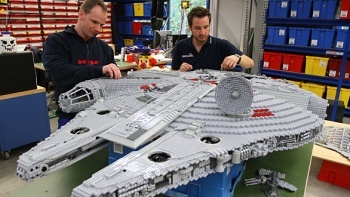 Lucasfilm has been working with Legoland to ensure the 1:20 scale models are accurate, and the entire project will use an approximated 1.5 million Lego bricks. The scenes from Episode I and II will be set on Naboo and Geonosis, respectively, while the Episode III scenes will transport visitors to Kashyyyk and Mustafar. The original trilogy section will feature the iconic landscapes of Tatooine, Hoth, and Endor, and the Clone Wars scene is set in the Crystal City on Christophsis. Each set will be populated with the appropriate vehicles and characters, with AT-ATs on Hoth and Obi-Wan and Anakin locked in battle on Mustafar. The scenes will also feature sound and other unspecified special effects, and guests will be both able and encouraged to walk through these recreations. The Star Wars area, which will be replicated in both Legoland Denmark and Legoland Germany, will also feature full-scale Lego models of Chewbacca, Darth Vader, and R2-D2 independent of the seven film-specific scenes.